I was asked if I would review Thermapen’s latest digital thermometer The Superfast Thermapen Mk 4 which sells for £50 + vat (£60) on the www.thermapen.co.uk site. As a starting point for this review, I asked a few friends whether they use a thermometer in their kitchen, and the majority said they did but didn’t feel confident in using one. So I thought I could also use this review to go over the basics. Many enthusiastic cooks have cupboards full of kitchen gadgets that in truth rarely if ever get used though they seemed a good idea at the time. So what would a decent thermometer do to improve your skills and confidence? I loaned out my Thermapen to my sister for a couple of weeks and here is her feedback……. 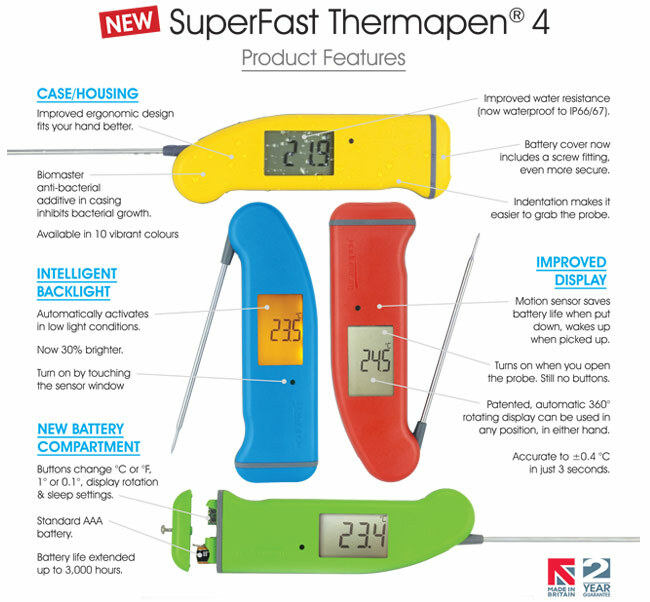 “I used the Thermapen Mk4 digital thermometer over a couple of weeks. I’ve never used a food thermometer before, relying on roasting chicken till the legs fall off and cutting open chops to check the inside. I wasn’t expecting the Thermapen to be particularly useful, but, in fact, I was very impressed”. Good for checking the temperature of roasting meats. Good for checking if your fridge or freezer are working correctly. Good to checking the temperature of food when you are reheating it. Jam making often requires a specific temperature, to check setting point. If you want to deep fry and you don’t have a deep-fat fryer. To temper chocolate (which gives it a sheen) or make a chocolate ganache. Making fudge, Turkish delights and many other types of candy. Bread making, for accurate temperatures to prove the dough faster. The Thermapen comes with a very useful guidebook that unlike many so-called guides will actually get used. 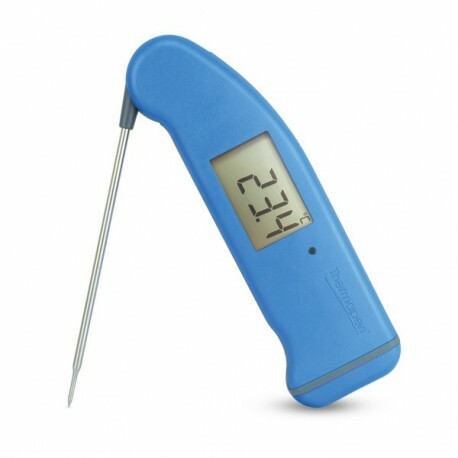 Explaining clearly how to get the proper temperature of the food, where to place the probe, how to check the accuracy of your Thermapen. It also explains about resting meat and how that keeps the meat tender and juicy and that meat actually carries on cooking (and in fact the temperature actually rises (for a short while) after it has come out of the oven, so you should allow for that. The also explains the safe temperatures for holding hot food (60 C or higher) and holding cold food safely needs a temperature of 5 C or lower. On the back page of the guide, there’s a very useful table of temperatures which I suggest you copy and laminate so you can keep it to hand. Unlike most of the digital thermometers out there this one is British made and very accurate and comes with a 2-year guarantee. When you have an accurate Thermometer and good instructions on how to use it you will wonder how you ever managed without one? Yes, you can buy cheaper thermometers but if the instructions don’t properly explain how to use it then it will probably end up in that cupboard along with all the other kitchen gadgets you don’t use. The probe folds down like a penknife for easy storage (which also turns it off) and the antibacterial casing comes in a variety of colours. Thermapen is not only used by avid home cooks but by thousands of professional chef around the globe, because of its accuracy and sturdy build quality. Maximum of two entries allowed per person (1 via facebook and 1 via blog comment) so double your chances and enter both ways!